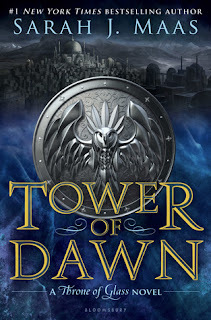 Tower of Dawn is set parallel to Empire of Storms but will follow Chaol Westfall - who was woefully absent from EoS - instead of the usual MC Aelin. I guess now it makes sense that he was MIA if he's going to get center stage in this one. I've always adored Chaol even though I've come to accept that who I first shipped him with simply wasn't meant to be. As Bec of Readers in Wonderland once said: I'm Maas thrash so naturally I'm eager to get into Chaol's POV...especially since this started out as a novella and turned into a full-length book. What the hell happens in Antica?! Yes, I'm so looking forward to this book! I really liked Chaol in the beginning of the series, but my positivist towards him began to wane quite a bit as the series wore on, so I'm really interested to finally read a book that focuses on him and his story and hopefully go back to liking him as much as I did in the beginning. Great pick! I hated that Chaol was absent in the last book! That and other things made me so upset with the series that I wasn't even sure I was going to continue...but knowing this one is all about Chaol, I think I'll have to pick it up after all! Awesome cover. Maas seems to be the bomb from what I've heard. Hope this one is awesome.